We had been debating between Moosilauke and Lafayette until half-way into our drive towards either. Erin and I always have great intentions for getting out the door early, and being great adventurers. But bed is just so comfy. We hadn’t gotten out the door until almost 9am. So despite Lafayette being the preferred mountain, we decided to go for Moosilauke as it was closer and shorter overall by a few miles. We stopped at the New Hampshire liquor store rest stop for breakfast, where they’ve replaced the cider donut truck with a permanent cider donut building! 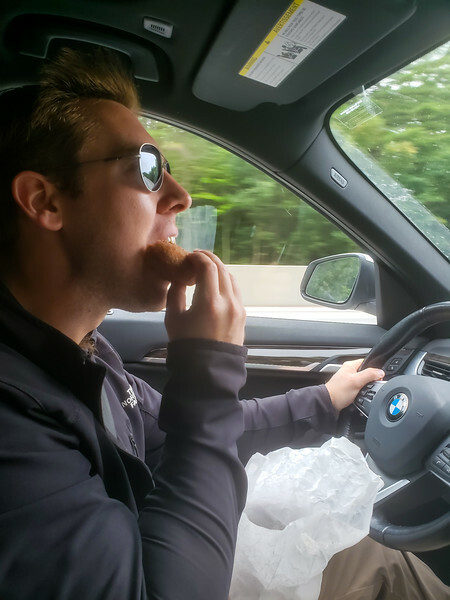 I texted Brian some pictures to make him jealous, and bought a baker’s dozen to munch on in the car. Arriving at the parking area for Moosilauke just before noon, we found ourselves parking all the way at the end of the three-quarter mile stack of cars for hikers already on the mountain. But we put on our hiking boots and attacked the mountain. I had originally told Erin the hike was around 6.5 miles round trip, and the mountain topped out at 4100’ ish. I was wrong. The hike to the top was 3.7 miles from the Dartmouth lodge, which was three-quarter miles up the road from our parking spot. In total, the hike would be 7.2 + 1.5 miles over 8.5 miles long, or roughly 40% more hiking than I had told Erin. Also, Moosilauke is 4800ft tall, revealed to us when we reached the summit. But I was much closer in my underestimation of that number. 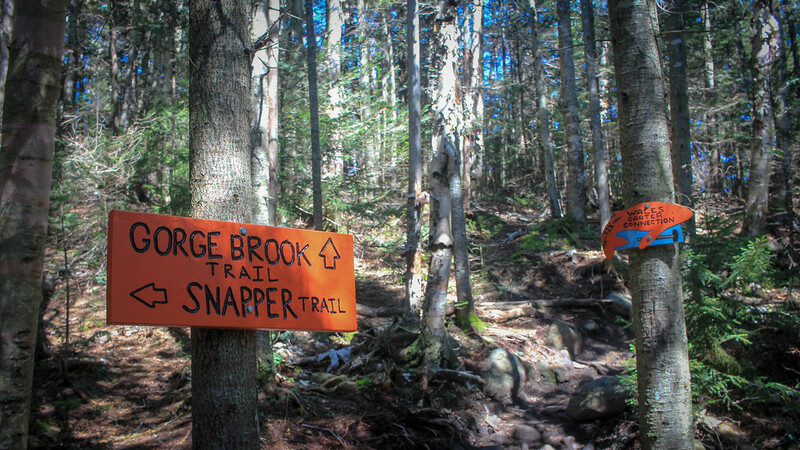 The trail we followed was called the Gorge Brook trail. It started from a mountain lodge built and maintained by Dartmouth college, and ascends through beautiful New England forest with a roaring stream as your companion for half the hike. Biscuit was all about hiking, and wanted nothing more than to lead his slow humans up the mountain trail. Biscuit asks, "What's taking so long?" At least, until the squirrels started yelling at him. Then all he wanted was to chase the squirrels. So we hiked, complaining to ourselves about how out of shape we were while minding our steps up the rock-filled path. But it was wonderful to be back in nature, especially with clean, clear air, low humidity and perfect temperatures. We passed many hikers coming down the mountain, having gotten an early start. They all reported that the view from the top was great, and that there was hardly any wind; I was a little worried about taking Biscuit above tree line into strong winds. We hiked and hiked, up the mountain, crossing bridges, up the small gorge, through conifer filled forests. Watching the trees gradually get shorter and shorter, until a brief tree break gave us our first glimpse of the view, and showed us how high we had hiked so far. Then we hiked even further, until finally the trees gave way suddenly to alpine grasses and a clear view of the rocky summit just ahead. We reached the summit three hours after leaving the car. 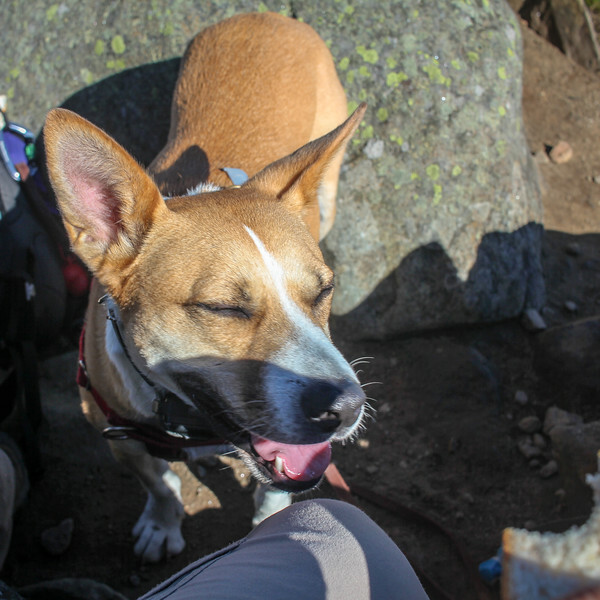 Enjoying our sandwiches and the view, we did have to restrain Biscuit from trying to chase a squirrel taunting us from the summit. We looked around, took some pictures, then started back down. Our descent took us along the Carriage Road trail, to the Snapper Trail, then back to Gorge Brook Trail, for a nice loop. 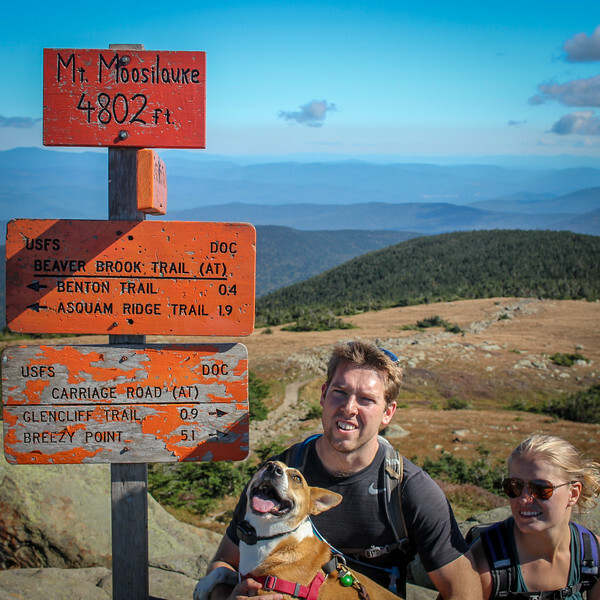 Moosilauke is part of the Appalachian Trail, so part of our descent was a mile of the AT. We reached the car around 6pm, for a hiking time of around 6 hours roundtrip for an overall pace of around 1.4mph. Not bad, and on the upper bound of what the web had estimated for the hike. Our hike successfully tired out both us and Biscuit. Despite his unlimited energy on the hike, he passed out once we were back in the car. We went to the Common Inn and Cafe in Rumney, NH for dinner, and left him in the car (with the windows appropriately cracked). I checked on him halfway through dinner, and when I shined my flashlight in the car, he just looked at me, yawned, then fell back asleep. We finished dinner and left the live music of the rustic-themed restaurant, and headed back to Rattlesnake campground to turn in for the night. It was warm and dark, and a low fog had set in at the campground, giving us an eerie preview of the coming New England fall. Erin and I packed ourselves in, and coached Biscuit from his comfy back seat into his crate in the tent, where he drank half a Nalgene water bottle and passed out for the entire night; not even waking to growl at trucks passing on the far-off highway.